This is the last full week of October, it contains the weekend before Halloween, and the Sunday that follows contains the second New Moon of October, called a “Black Moon” by some. Jim Shawvan identifies a long “opportunity period” from Saturday afternoon until when the Moon goes void early Monday morning. Mercury is void from early Saturday morning (as part of an annoying or “motivating” series of lunar squares) until it enters Scorpio about 4 PM Monday and is “too early to tell” (an horary term but we adopt it for predictions) until near the end of the week, about Friday or Saturday. 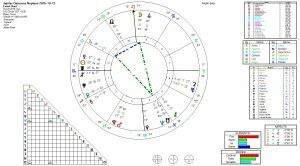 Perfection of this occurrence of Jupiter quincunx Neptune also contains a Yod, and if you are willing to use the Nodes (lunar nodes, “Ketu” and “Rahu”) then a Focused Yod is also present here.